– Extract from “Winnie the Pooh” by A. A. Milne, first published in 1924. 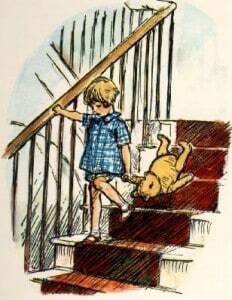 Poor Pooh Bear, constantly being bumped down the stairs. Surely when his arm drops off followed by a missing eye, Christopher Robin will wonder if there was a better way of getting him to the bottom of the stairs? If Christopher Robin had seen things differently he wouldn’t have continued with this rather barbaric way of transport! It explains that what we GET is a product of what we DO which is influenced by what we SEE: you would think therefore that if we are not pleased with the outcomes in a particular area (results), the obvious action would be to change what we do (the behaviour). However, very often we don’t and instead keep doing the same thing, hoping that somehow we will obtain a better result. I think at times we are all guilty of this and need to remind ourselves that what we need to do is “see” things differently to obtain better results. If we try and take an alternative perspective, this may lead to us doing things another way which in turn may give us different – hopefully better – results. “Reflect” enables us to stand apart from ourselves, seek feedback and question what we see. This is where collaboration with a trusted colleague is key. If only Christopher Robin had stopped at the bottom of the stairs, spoke to his mother, and seen the stairs differently maybe Winnie wouldn’t now have his arm in plaster and a patch over his eye! Long live Winnie the Pooh and here’s to seeing things differently to improve our end results.